Get ready for the ultimate healthy breakfast recipe that’s going to change your life! 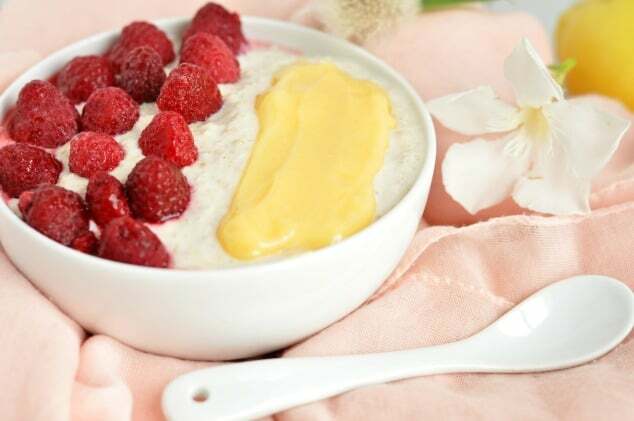 Wholesome, filling oats mixed with tangy Greek yogurt, topped with rich, creamy lemon curd and tart, fruity raspberries. Seriously, these lemon raspberry overnight oats taste so good you’ll think you’re eating dessert, not a nutritious breakfast! I love chocolate. Even for breakfast. And while I eat chocolate chip cookie dough overnight oats and black forest overnight oats all the time, my tastes totally change around summer. As soon as it’s beach season, my love of chocolate almost dwindles to nothing and is replaced by an obsession for everything tangy, citrus-y and zesty. 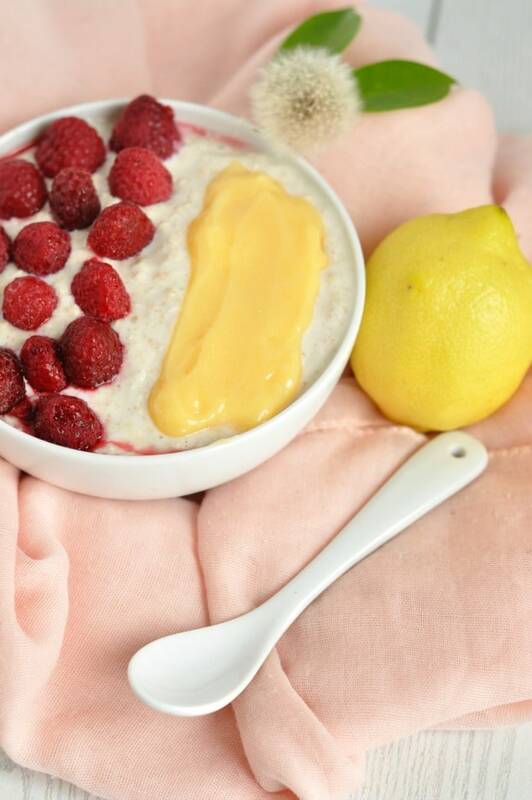 Which is what these lemon raspberry overnight oats are all about. Sure the oatmeal base is pure comfort food, but it’s chilled overnight. So you don’t feel like you’re digging into a great big bowl of winter-perfect oatmeal that’s going to leave to feeling stuffed all morning. 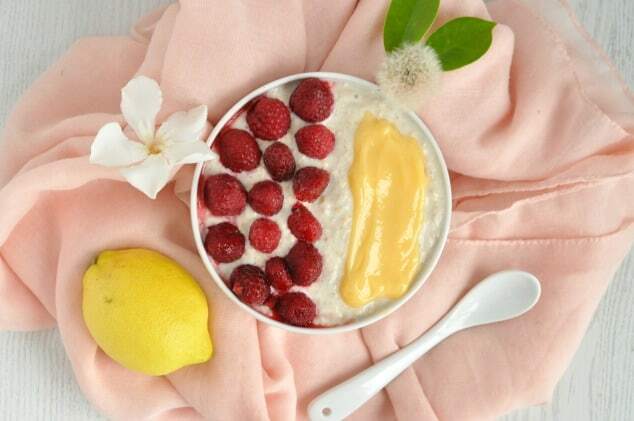 Instead, your savoring a delicate medley of cool and creamy oats, ripe tangy raspberries and velvet-smooth lemon curd. So even if you’re a 100% dedicated chocolate lover, you’re still going to fall head over tails for these lemon raspberry overnight oats. I don’t actually have any first-hand experience of non-chocolate-lovers. But just like there are people out there who don’t love avocado, there are probably also people out there who would choose peanut butter over Nutella. Potato chips over a chocolate bar. And coffee over hot chocolate. If you fall into that category, today’s recipe is dedicated to you. 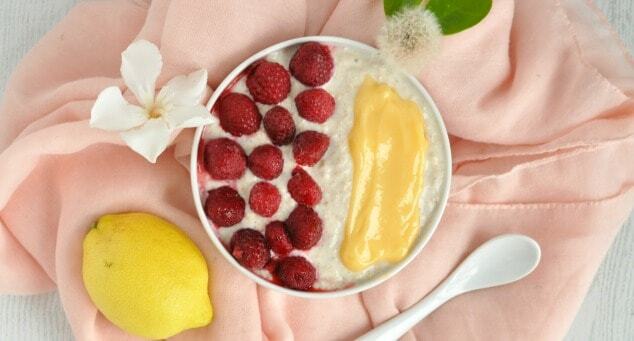 Loaded with fruity flavours, wholesome ingredients and gorgeous textures, these lemon raspberry overnight oats are perfect for anyone who wants a sweet treat in the morning but can’t stomach chocolate at that early time of day. In a small bowl, stir together the oats, sugar, yogurt and milk. Place into a sealed container and leave in the fridge for at least 4 hours to chill. When you're ready to eat, scoop the oats into a serving bowl and top with lemon curd and raspberries. This jar of overnight oats will keep perfectly well in the fridge for up to five days, so you can make it up well in advance. This looks delish! I really can’t wait to give it a try. Wow….this looks amazing! Your pictures are fabulous and those raspberries look delish! I can’t wait to give this recipe a try! Thanks for sharing! PINNED! These look really yummy, bet they taste good. Pinned for a later date. I love overnight oats but haven’t tried this combination. Will have to because it looks crisp and refreshing. Thanks for sharing! This sounds delicious! I’m afraid I am one of those fruit (and peanut butter) over chocolate people most of the time so this is right up my street! Mmmmm – looks good! This one is being pinned so I can try it out for back school breakfasts! Thanks so much, Alayna! It really is the perfect back to school breakfast – all the prep is done the night before so you just need to open and eat it in the morning! I love both chocolate and fruit, but if I had to choose, I’d go fruity, these overnight oats sound fantastic! Thanks for sharing at What’d You Do This Weekend?! The lemon raspberry oats may be my favorite breakfast ever. I tried several fridge oats recipes and this one was the best- because not only was it this heavenly cold dessert, it required zero morning prep, and it kept me full all the way to lunch! This is going to be a staple in my house. Thank you! Thank you so much for your kind words, Susan. You feel exactly the same about these overnight oats as I do! Even though I loooove chocolate, these lemon raspberry overnight oats win me over every single time. Would it be alright to use blueberries instead of raspberries? Have all the ingredients to try but am not sure what size jars to buy??? Can’t wait to test out this yummy delectable morning treat. Hey, Amy! I use old jam jars which can hold around 1 cup in volume. Hope this helps! This was so good! There just aren’t enough lemon curd recipes in the world lol, so thank you for this! Thanks so much, JB! I totally agree with you – I LOVE lemon curd! This is my favorite overnight oat recipe ever. It is my go to breakfast on my long run days! I am trying this with blueberries tonight – didn’t have raspberries. I am sure it will be just as wonderful! Thank you for this recipe!